Let’s run through the ones we know and then learn the [new] one. Paul McCartney was right. There was a format. At least there was a framework developing as the Beatles rehearsed in their second week at Twickenham. As covered in the last post, George Harrison would have to wait a few hours for attention to return to his new “For You Blue.” Instead, with the full band ready to go nearly 90 minutes into the January 9, 1969, Nagra tapes, the Beatles tackled “Two of Us” for the fifth time in six days, initiating a sequence in which the group returned to some of the finished, core songs they’d have for their live show. Why, it was their format! This stretch also clearly exposed the side of the Beatles that everyone (else) usually cites when describing the Get Back sessions. While I’m quick to argue January 1969 at Twickenham was not of itself the downfall of the band as it was filled with harmonious, joyous and highly fruitful moments to match the uglier, fractious component of the sessions, these guys could get pretty petulant and didn’t hide it with the tapes rolling. A quick, carefree one-off into the song the day before, this day’s “Two of Us” rehearsal stretched about a half-hour, and quite unlike the Rocky and the Rubbers’ version, Paul insisted on serious refinement. As loose as their run-through was early on the 8th was exactly how tense things emerged on the 9th, with consistent, stuttered efforts to get through a full song. They had another go at the song, and “it’s still pathetic,” in Paul’s words. He suggested the issues went beyond just the song’s speed. As Paul nitpicked what arrangement the song needed entering the bridge, John argued, “We never got into this [part] yet,” defending himself and the others as Paul criticized the group for not knowing what’s in his head. A fiery example of the strain came during a “Two of Us” take in which Paul barked at John, who wasn’t in perfect rehearsal position, to “get on the mic.” John, certainly responding to the tone more than the instruction itself snapped back. The band immediately went into another take, and you can hear John loud and clear — but he came in early. You can hear Paul’s displeasure when he comes in himself at the right time. Still, they championed on. (This sequence was in the Let It Be film, and led immediately to the “I’ll play, you know, whatever you want me to play” sequence from three days earlier. A dark moment, for sure, but as usual for these guys, they were able to compartmentalize and still harmonize figuratively and literally. Picking apart “Two of Us” to improve the various “bits” and now focusing on the middle eight, Paul started thinking out loud. Never mind that the “oohs” are actually “aahs” when Paul, John and George instantly launch into a demonstration of the vocals, which are proposed to appear supporting the “you and I have memories” lead. This is the Beatles magic, immediate and spontaneous and completely normal, even when it comes a few minutes after one member complains about the other one’s bitchiness. The subsequent stab at the staccato vocalization came off a bit sloppier but still likable. Concerned the backup line would sound “too thin,” George proposed, “Maybe we get a few Raelettes,” marking yet another time the group evoked Ray Charles’ backup singers. “Get three girls” with some phasing on the mics. John’s cheeky reply was to bring in three boys instead, and George named the Dallas Boys, Britian’s first boy band (by ’69 they were into their 30s). 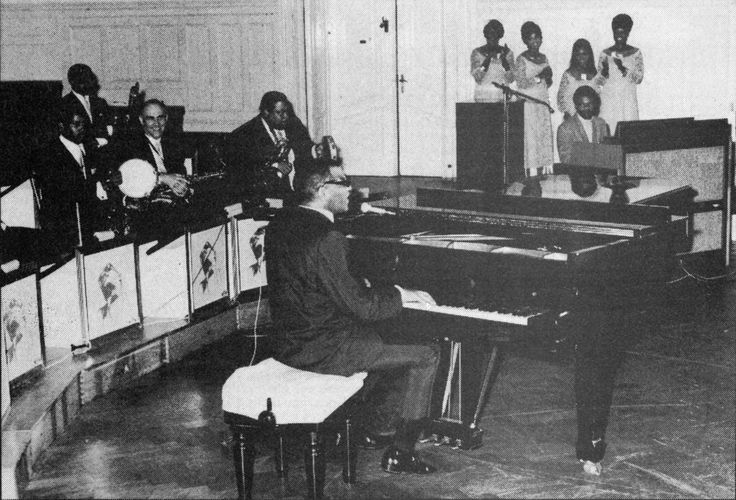 While they never landed the Raelettes, the Beatles would soon enlist the man seated before them, Billy Preston. (Photo from late 1968). Ultimately, Paul asked the others to “just think of something, then” for the middle eight, and off they went into another take, this one featuring the lovely “aahs.” The song may not have dramatically improved, but the mood had over the last 25 or so minutes on the tapes. But Paul still had something to complain about, turning his attention to a frequent (and legitimate) punching bag for the band, the equipment setup at Twickenham. If we think the tapes sound diluted, just imagine how substandard the quality must have been for the musicians on the sound stage. With the proposed show nearing — and despite some pretty ambitious ideas, uh, floated less than 24 hours earlier — improved sound needed to be addressed along with other facets of a finalized live performance. And here’s where we return to a disagreement among the principals, but with a far different result than earlier. John: I thought we’d get into that when we do a few more. George: We still have dance steps to learn. Paul: And the jokes in between. The esprit de corps resumed as the group advanced to a singular take of “Don’t Let Me Down.” There was no nibbling, no exhausting search for a missing “bit,” and even when there was a screw-up on the lyric, they powered on and completed the song in a tidy 3:10. It’s got to be like pain. What an instruction! Paul desperately and relentlessly attempted to communicate how he wanted the part to sound — gesticulating, vocalizing, playing it on the bass — but John simply couldn’t or wouldn’t accurately nail the brief solo. In another editing trick that showed up in the Let it Be film, John did, in fact, nail it. That’s because the film shows the January 8 “Rocky and the Rubbers” take of the song (where Paul shouts a celebratory “good evening!” after the part is played), and spliced it on both ends of a brief portion of this sequence from January 9. Ultimately, John hit the part satisfactorily enough for the Paul to continue the group through their core set. The mood rose again for another jubilant effort of “One After 909,” although we don’t get a complete grasp of the rehearsal due to the tape cutting in and out. We can pretty safely assume, though, that like “Don’t Let Me Down,” the band tore through a single take. As John moved over to the piano, the Beatles practiced their stage patter, in hilariously fake sincere voices. It was a straightforward, strong take of “She Came In Through the Bathroom Window,” although we don’t hear the whole thing on the tapes. Far less straightforward, but wholly enjoyable was a string of takes broken up by tape cuts, including one with John taking the lead vocal with a heavy Cockney accent. Now, five minutes past 1 p.m., the group broke for lunch. Paul offered a brief impression of Elvis — who someone mentioned turned 34 the day earlier. Formal recording for Abbey Road wouldn’t come until months after the Beatles’ January 1969 sessions and not until the project was shelved along with its stable of new songs. It’s with the luxury of retrospection we can establish that the sessions served as a demo venue for Abbey Road, not a bad byproduct of the weeks in the studio. To this point — the pre-lunch portion of the January 8 session — the Beatles had in one form or another performed six future Abbey Road tracks (”Maxwell’s Silver Hammer,” “Oh! Darling,” “Sun King,””She Came In Through the Bathroom Window,” “Golden Slumbers” and “Carry That Weight”) that were either contenders for the live show or simply unfinished bits for another day, if any. New to the Get Back sessions, “Mean Mr. Mustard” wasn’t at all new to the other Beatles, who had heard John’s demo for the song the previous May at Kinfauns. You, too, can hear it for yourself if you crack open your copy of Anthology 3 and pop in the first disc, or on the 2018 reissue of the White Album. Or just listen below! Pretty earthy, but that’s the Esher Demos for you. Like “All Things Must Pass” and others, the influence of the group’s February 1968 India trip stretched far past the subsequent White Album. Back in Twickenham, Mr. Mustard’s sister was still Shirley, and he’s yet to rediscover his roots with Polythene Pam. Her sordid story will come later. First, we can enjoy John performing “Mean Mr. Mustard” at the Get Back sesssions. A bit more fleshed out with full instrumentation, the first 1969 take of “Mean Mr. Mustard” is roughly what it was nearly a year earlier, and not awfully far off from what it would become later on Abbey Road. It also stands as an alternate version of his work-in-progress “Madman,” which was a few days away from debut at these sessions. But the Madman’s story will come later, too. But is one man’s trash another’s treasure? All right, fine. Paul probably wasn’t inspired by this take of “Mean Mr. Mustard,” despite sharing bouncy piano chords, but it wouldn’t have been the first time a song drawn from these sessions would bizarrely resurface many years later. Before breaking for a bite, the Beatles returned to another song that would later be separated only by one track on the Abbey Road Side 2 medley. The number had already had a few rehearsals over the last few days, but it finally was given its formal name on January 8. 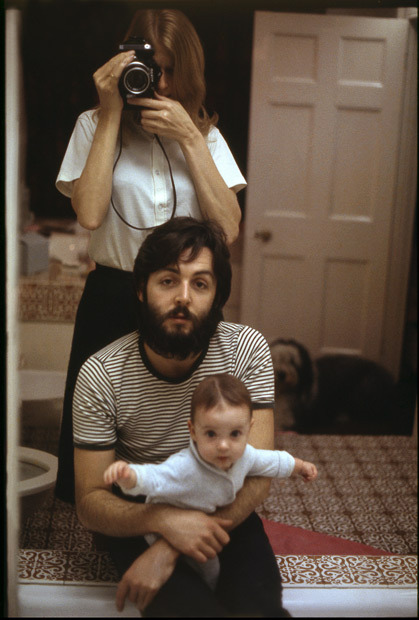 Paul, Linda, Mary and Martha in the bathroom, 1969. The window is out of frame. An earlier stab at a rehearsal never materialized, but after the Beatles spent about a half hour focusing on “All Things Must Pass” and John’s quick “Mean Mister Mustard” detour, the “Window” was reopened. “Do you want to stay on that for ‘Bathroom Window? '” Paul asked John, who was still at the piano. He did, and it marked the third consecutive day the group spent time on the song. Mentioned previously in this space, one delight of the Twickenham takes of “She Came In Through The Bathroom Window” is the chance to hear Paul harmonizing with John on the song. Remember the Abbey Road version features Paul double-tracked. Still, it’s hard to call these takes ultimately pleasurable. After some brief instruction, we hear three total takes of the song, with the first two dragging to the finish. The final take is a bit livelier. Unlike other McCartney compositions in the first week of the sessions, the song is indeed complete, though, with the same lyrics, melody and general instrumentation as we’d hear on Abbey Road, once that blessed day would come. Now with “Mustard” on the table and the “Window” closed, the Beatles adjourned, quite appropriately, for lunch. Every day at Twickenham was drama-filled and pivotal. Every day during the Get Back/Let It Be sessions was drama-filled and pivotal. Every day the Beatles recorded together was pivotal, if not necessarily drama-filled, right? January 7 was a particular special day. Dramatic. Pivotal. The group talked in circles about the live show and their reasons for even remaining together. Paul bestowed us with a chunk of the Abbey Road medley as well as “The Long and Winding Road” and “Get Back.” George tried — but didn’t — quit (yet). John worked “Across The Universe” back into the Beatles’ plans. The band very possibly invented the mashup. Billy’s missing, but every other element from the song as we know it now sounds like it’s there, from George’s whiny guitar line and solo to Paul’s and John’s vocal and Ringo’s tight beat. The song is show-ready, even in this early rehearsal. I think this is less a half-hearted attempt than the group genuinely doesn’t remember how to play that song anymore. Regardless, it was merely a blip, albeit a somewhat interesting one, in the sessions. Unlike other days, the group didn’t pay significant time to sincerely playing covers. We get to hear a loose take of Little Richard’s “Lucille” for the second and final time on the tapes (January 3 was the previous performance). That was preceded by a rehash of Chuck Berry’s “Rock and Roll Music” that got better as the band played, although admittedly they kicked it off from an weak position and ended up in a slightly less-so place. There’s little question the group sounds like it’s having fun playing songs they all know, even if they’re not executing well. John also dipped into the group’s more recent catalog, plunking a few notes of “Revolution” in a sequence that soon saw him lead the group into Gene Vincent’s “Be Bop a Lula,” a song with extensive Beatle ties. It was the first record Paul ever bought, a song John played going back to the Quarrymen days and it was played live extensively in the Beatles’ early days. Ultimately, John would record it on “Rock & Roll” more than five years after these sessions, while Paul opened his landmark Unplugged appearance with the song in 1991. 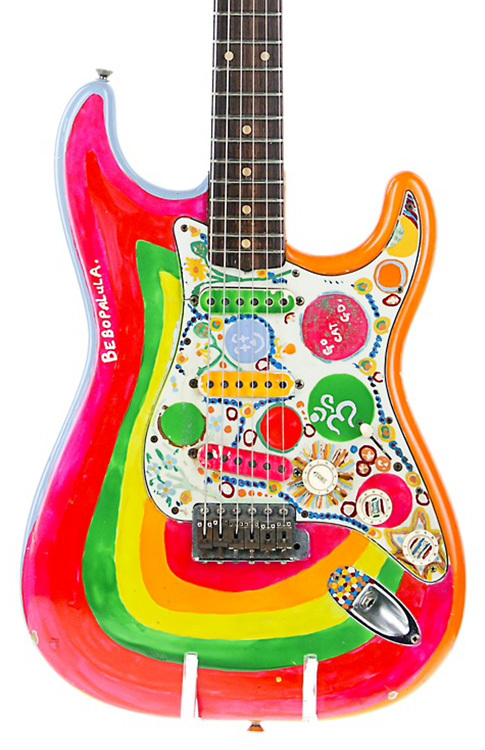 The song was always with George: He scrawled “Bebobalula.” on his colorful Stratocaster, Rocky. The tapes of the day’s sessions would end with the group in the midst of “She Came in Through the Bathroom Window” rehearsals. As you can hear, there was no significant work done to the song since its debut the day before. Six hours of tapes that inspired 12 posts — and this one makes it a baker’s dozen. Some songs are introduced, others tortuously rehearsed and the proposed live show is discussed at length for the first time. So before ripping off the desk calendar page and welcoming Jan. 7, 1969, I wanted to tie up some loose ends and look at a few songs and moments that were important enough to mention but not so much to warrant standalone posts. “One After 909” wasn’t the only unlikely John Lennon song resurrected in the first few days of the sessions. “Across the Universe” was recorded 11 months prior — a pre-White Album contemporary with “Lady Madonna,” “The Inner Light” and “Hey Bulldog” — and sat finished but not yet released as of January 1969. There’s more than enough to say about the song at this point to justify its own post — and it will. Once the song has a more prominent role, in the next day’s session, I’ll do more than offer this brief mention. While George had introduced other songs,”All Things Must Pass” remained the primary Harrisong to this point the band was rehearsing. Jan. 6 saw just a smattering of takes running about 20 minutes on the tapes, barely memorable. Frankly, the song sounds like a dirge at times thanks in part to John’s unimaginative organ droning. It’s such a great song, and I keep telling myself — “This is The Beatles doing ‘All Things Must Pass,’ for heaven’s sake” — but I don’t find myself caring, which pretty much puts me on par with the rest of the group. That sentiment was encapsulated in a brief exchange at the end of what would be the day’s final run-through of the song. Paul: Wanna to do it again, George? This was the song’s introduction to the sessions, and with the day nearing an end, it was a brief one, lasting just 15 minutes on the tapes. The song’s pretty well crafted at this early stage, as far as structure and lyrics. It took only a few takes and just a couple of minutes for the band to pick up the chords and string together a few reasonably decent takes. It’s nice to hear the voices of George and John deliver harmonies, since we’re used to Paul double-tracked on the recorded Abbey Road version. Eventual Abbey Road medley mate “Carry That Weight” was a Paul suggestion as a vehicle for Ringo, and he wasn’t alone thinking about giving a song to the drummer. It’s just that Paul was the only one who wrote a song that endured. John offered up about half a minute of the upbeat “Annie,” which sounds just barely sketched out enough not to be an improvisation. There’s not much meat to the bones, but it’s pleasant enough and very easy to hear Ringo singing it. Not to be left out, George immediately followed with a new song he likewise said was for Ringo. More fleshed out than “Annie” — or “Carry That Weight,” for that matter — “Maureen” was credited to Bob Dylan, according to George. It’s folky and laid back, and there’s no reason necessarily to think it’s not a product of the November ’68 Harrison-Dylan sessions in upstate New York, if you accept the premise Dylan was writing songs named for Ringo Starr’s wife in George’s style and less his own. As it would happen, George and Maureen did have a lengthy affair, but Pattie Boyd’s autobiography only pins it to the early 1970s. But who knows what was going on before that — I don’t, and I’m drifting badly off-topic in discussing band members’ infidelity. What the song does do, like so many other random bits of music that passed through Twickenham, is add another curio to sessions replete with such oddities we’d never hear from again. The group tackled a few covers, but of course they did. It’s a hallmark of these sessions, and a wildly overrated and overstated hallmark to boot. One of the memorable covers of the day was an oldie they had mastered in the past and was so strongly associated with their live act. Surprisingly, it’s the only time they performed a take of “Dizzy Miss Lizzy” at the sessions, and it apparently happened to be an instrumental (any singing was off-mic, at least). Clunkier and a little slower than the original, if it was ever to be remotely considered for this live show — and there’s no indication it was to be — they’d probably just rely on memory. Perhaps the covers throughout the duration of the sessions could be described as red herrings along with the one-off originals like “Annie” and “Maureen” — interesting merely because they’re rare Beatles recordings, but not nearly as enlightening as seeing the songs we know develop or listening to the fascinating conversation about the live show and the future of the band. With that, I’ll close the book on Jan. 6, 1969. See you “tomorrow”!